News>Other>First Minister of Wales Carwyn Jones has today launched Programme 2016 to mark the centenary of the First World War. 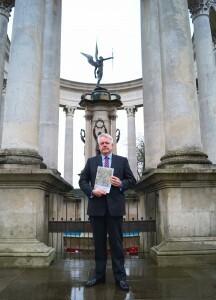 First Minister of Wales Carwyn Jones has today launched Programme 2016 to mark the centenary of the First World War. Programme 2016 is the latest in the Welsh Government’s series of annual Cymru’n Cofio Wales Remembers 1914-1918 brochures which highlight events and projects of Welsh interest taking place in Wales and further afield during 2016. The launch coincides with the First World War Partnership Day event being held in Aberystwyth. The central focus for this year’s commemoration is the Battle of the Somme. Of particular resonance for Wales, the centenary of involvement by the 38th (Welsh) Division at the Battle of Mametz Wood will be remembered on 7 July. Later in the year, Caernarfon Castle in North Wales will host Poppies: Weeping Window by Paul Cummins, artist and Tom Piper, designer. The iconic poppy sculpture, which was part of the Blood Swept Lands and Seas of Red installation at the Tower of London, will be in place for Remembrance Day and for the centenary marking the end of the Battle of the Somme. F irst Minister Carwyn Jones said: “Cymru’n Cofio Wales Remembers 1914 – 1918 gives us the opportunity to reflect on the significant impact the First World War had on the people of Wales – and to commemorate the lives of those who served at home and abroad. “The sacrifices the people of Wales made, alongside the rest of the UK and allied forces, should never be forgotten. It’s so important that future generations know and understand how this terrible war shaped modern Wales, and we must seek to learn lessons to take us forward into a more peaceful world. 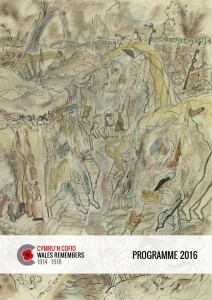 To see the Cymru’n Cofio Wales Remembers 1914-1918 Programme 2016 click here.